The avalanche danger remains CONSIDERABLE in the Alpine elevations (>2,500') for triggering a slab avalanche 10-20" thick. These slabs are sitting on very weak faceted snow and a high likelihood exists for triggering one on slopes steeper than 35 degrees. Below 2,500' in the Treeline elevation band, there is a MODERATE danger where wet loose and possibly wet slab avalanches can be triggered on steep slopes and gully sidewalls. *The avalanche danger is expected to rise tomorrow as a very warm and wet storm is on the doorstep. Strong Easterly winds yesterday, along with a powerful warm storm moving in this evening, will keep our tenuous snowpack on the brink. Although visibility was limited yesterday, we were able to see two natural slab avalanches (~12" thick with wide propagation) that occurred sometime early in the morning. These were on the North side of the Magnum Ridge on Turnagain Pass where winds commonly cross-load the North facing gully features (photo below). With a well-documented layer of weak faceted snow underlying the recent snowfall from February 11th, it is not a surprise to see this natural activity. Although there are variations in snowpack structure region-wide (Girdwood Valley to Turnagain Pass to Summit Lake), the set-up for today and coming into this evening's storm is similar: Essentially, we have very weak faceted snow that sits under dense slabs anywhere from 4-20" thick. Some of these slabs are older and some newer, but nonetheless we have weak snow under them. Along with that, below 3,500' many of these slab-weak layer combos have a slick melt-freeze crust underneath; this can act as a bed surface and encourage propagation of a slab if one is triggered. Before the addition of snow and wind later tonight for nature to start tipping the balance, human triggered avalanches will be likely. These areas are mainly confined to upper elevation steep slopes over 35 degrees harboring a slab 6" thick or thicker. Watch for collapsing and cracking and triggering an avalanche remotely will be possible. With a bit less-than-desirable surface conditions below 3,000', it may be best to let this next storm roll through before venturing down to Turnagain Pass. Warming temperatures and rain on snow up to 2,000' later tonight will keep wet avalanche activity on the radar. Although a superficial re-freeze has likely occurred overnight and we only saw a few wet loose avalanches yesterday, a higher rain/snow line should re-activate and encourage wet slides. With a poor snowpack structure in the top 1-2' of the snowpack, the potential is there to see shallow wet slab avalanches along with the typical wet loose variety. Yesterday's weather boiled down to overcast skies, strong Easterly winds and little precipitation. See the tables below for exact numbers. Although little precipitation was seen on the Pass itself, it was raining moderately on the far Northern end and in Portage Valley. The rain/snow line was around 1,500' and seemed to lower slightly through the day. This morning we should see a brief lull between storms as winds and showery precipitation have died down. 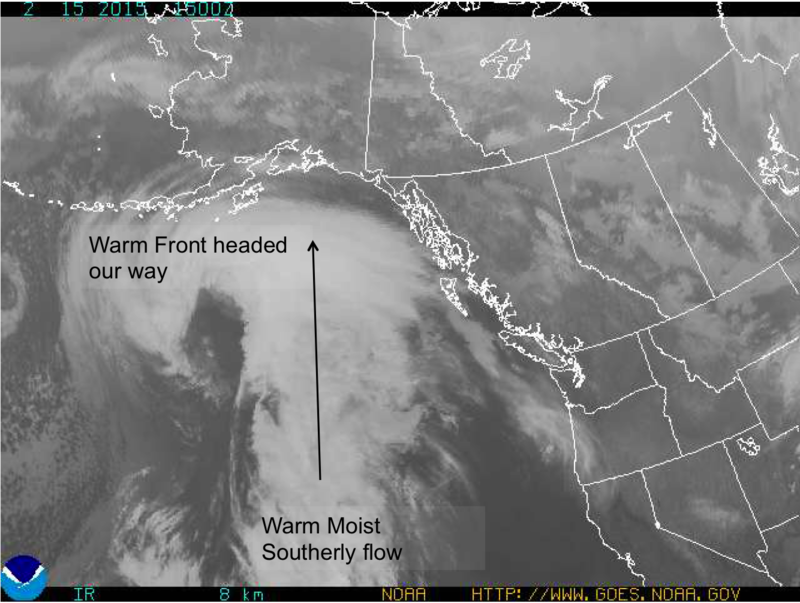 The Satellite image (seen below from 6am) is showing a large - and warm - plume of moisture headed our way later today. Expect winds to pick up to the 30's mph from the East this afternoon, visibility to shut down and light rain begin to fall up to 2,000'. Temperatures should remain in the upper 30's F at 1,000' and warm to ~30F on ridgetops. Beginning this evening and into tomorrow, gale force winds, rain up to 2,500' (or higher) and around 2" or more of water amounts are expected!! The good news with this system is that the models are showing colder air wrapping in for Monday evening; this will hopefully lower the rain/snow line before it stops precipitating. Stay tuned on tomorrow's advisory.